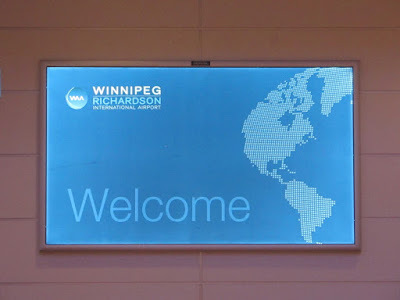 I flew to Winnipeg on Oct. 30, 2011 en route to Churchill, Manitoba. It just happened to be the day the new terminal at the James Armstrong Richardson International Airport officially opened. It was a total airport day for me, as earlier I'd spend part of my layover in Vancouver chatting with Jaeger Mah, the storyteller at YVR who was wrapping up his 80 days living at Vancouver International Airport. 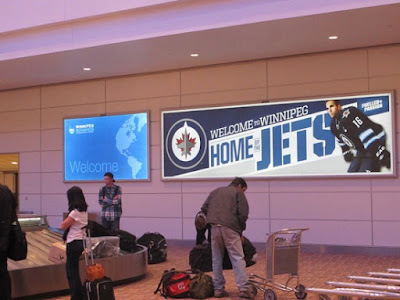 I was at the airport in the central Canada capital of Winnipeg about eight years ago during a trip to Manitoba and Saskatchewan. The 1964-built terminal wasn't memorable, so I can't compare old and new. 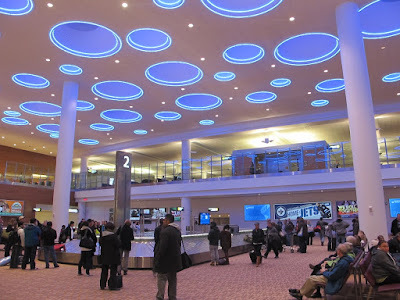 But the big, bright new terminal in Winnipeg is right up there with airports I've been to in Hong Kong, Beijing and Singapore. Beautiful! The $585 redevelopment started nearly a decade ago. It's the largest construction project in Winnipeg's history, and includes a new parkade that was completed in 2005, and now the 51,000 square meter terminal building. LEED Certified, its 10,000 square meters of glass brings in natural light, reducing electrical consumption and greenhouse gases by 52% over comparable buildings. The curtain wall ventilation system distributes air with maximum efficiency, and the space is Manitoban in feel, with locally sourced granite and native prairie grass landscaping. The second-story departure level has wrap-around views of Winnipeg's skyline and Manitoba's big sky. The most distinct feature, seen in the top photo, is a constellation of 55 skylights in the arrival area. Master architect was Pelli Clarke Pelli Architects of New Haven, CT -- which also designed the Petronas Towers in Malaysia, the International Finance Centre in Hong Kong and Haneda Airport in Tokyo. It does have an Asian air about it. Well, except for the restaurant offerings! There are local outlets: Stella's Cafe & Bakery (fifth location in Winnipeg) and a diner called Salisbury House (famous for its Nip burgers and the Winni hot dog). There's also T.G.I.Fridays, Starbucks, and of course, Tim Hortons for your Timbits fix. I didn't have time to check out all the art, but did see the four-meter tall bronze statue of James Armstrong Richardson, a gift from Winnipeg's prominent Richardson family. 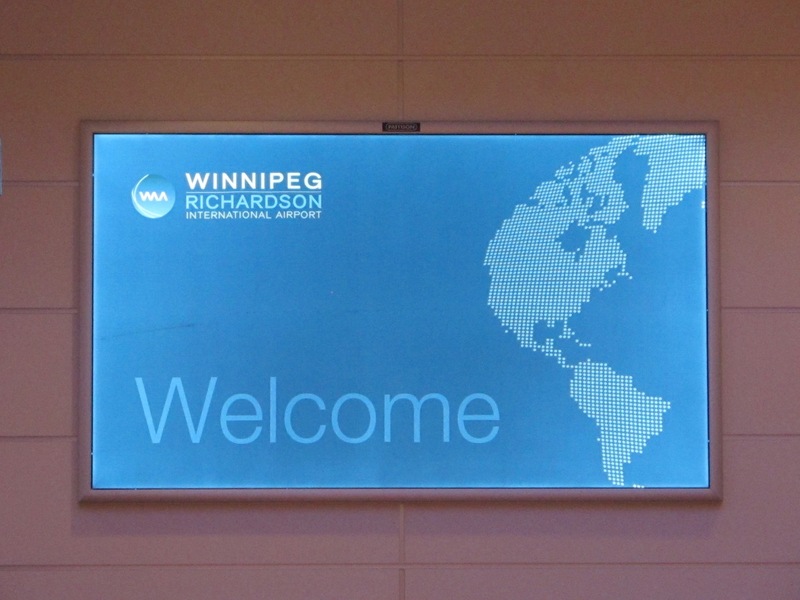 Richardson is considered Canada's commercial aviation pioneer -- he was a pilot with the Royal Canadian Air Force and founder of Canada's first national carrier, Western Carrier Airways Ltd. Elsewhere in the terminal is glass artist Warren Carther's Aperture, a pair of glowing green mini icebergs in the Queens Court area of the departure level. On the arrival level is Winnipeg artist Joel Berman's Inside Ice, which looks like an iceberg cascading down the ceiling. As far as passenger amenities, there are now 32 common-use kiosks for check-in that can be used for all carriers -- bags are dropped off at a common area. James Armstrong Richardson International Airport currently handles 3.4 million passengers a year, with the volume expected to reach 4.6+ million by 2020. And that number was forecast before the return of the Winnipeg Jets and the opening of the Canadian Museum for Human Rights.